The Boeing X-37, also known as the Orbital Test Vehicle (OTV), is a reusable uncrewed spacecraft. It is boosted into space by a launch vehicle, then re-enters Earth's atmosphere and lands as a spaceplane. The X-37 is operated by the United States Air Force for orbital spaceflight missions intended to demonstrate reusable space technologies. It is a 120%-scaled derivative of the earlier Boeing X-40. The X-37 began as a NASA project in 1999, before being transferred to the U.S. Department of Defense in 2004. Its first flight was during a drop test in 2006. There have been five X-37 orbital missions. The spaceplane's first mission, USA-212, was launched in April 2010 and returned to Earth in December 2010. A second X-37 was launched on mission USA-226 in March 2011 and returned in June 2012. The third mission was USA-240, which launched in December 2012 and landed in October 2014. The fourth mission, USA-261, launched in May 2015 and landed in May 2017. The fifth and latest X-37 mission, USA-277, launched on 7 September 2017. In 1999, NASA selected Boeing Integrated Defense Systems to design and develop an orbital vehicle, built by the California branch of Boeing's Phantom Works. Over a four-year period, a total of $192 million was spent on the project, with NASA contributing $109 million, the U.S. Air Force $16 million, and Boeing $67 million. In late 2002, a new $301-million contract was awarded to Boeing as part of NASA's Space Launch Initiative framework. The X-37's aerodynamic design was derived from the larger Space Shuttle orbiter, hence the X-37 has a similar lift-to-drag ratio, and a lower cross range at higher altitudes and Mach numbers compared to DARPA's Hypersonic Technology Vehicle. An early requirement for the spacecraft called for a total mission delta-v of 7,000 mph (3.1 km/s) for orbital maneuvers. An early goal for the program was for the X-37 to rendezvous with satellites and perform repairs. The X-37 was originally designed to be carried into orbit in the Space Shuttle's cargo bay, but underwent redesign for launch on a Delta IV or comparable rocket after it was determined that a shuttle flight would be uneconomical. The X-37 was transferred from NASA to the Defense Advanced Research Projects Agency (DARPA) on 13 September 2004. Thereafter, the program became a classified project. DARPA promoted the X-37 as part of the independent space policy that the United States Department of Defense has pursued since the 1986 Challenger disaster. The vehicle that was used as an atmospheric drop test glider had no propulsion system. Instead of an operational vehicle's payload bay doors, it had an enclosed and reinforced upper fuselage structure to allow it to be mated with a mothership. In September 2004, DARPA announced that for its initial atmospheric drop tests the X-37 would be launched from the Scaled Composites White Knight, a high-altitude research aircraft. The Scaled Composites White Knight was used to launch the X-37A on glide tests. On 21 June 2005, the X-37A completed a captive-carry flight underneath the White Knight from Mojave Spaceport in Mojave, California. Through the second half of 2005, the X-37A underwent structural upgrades, including the reinforcement of its nose wheel supports. Further captive-carry flight tests and the first drop test were initially expected to occur in mid-February 2006. The X-37's public debut was scheduled for its first free flight on 10 March 2006, but was canceled due to an Arctic storm. The next flight attempt, on 15 March 2006, was canceled due to high winds. On 24 March 2006, the X-37 flew again, but a datalink failure prevented a free flight, and the vehicle returned to the ground still attached to its White Knight carrier aircraft. On 7 April 2006, the X-37 made its first free glide flight. During landing, the vehicle overran the runway and sustained minor damage. Following the vehicle's extended downtime for repairs, the program moved from Mojave to Air Force Plant 42 (KPMD) in Palmdale, California for the remainder of the flight test program. White Knight continued to be based at Mojave, though it was ferried to Plant 42 when test flights were scheduled. Five additional flights were performed,[N 1] two of which resulted in X-37 releases with successful landings. These two free flights occurred on 18 August 2006 and 26 September 2006. On 17 November 2006, the U.S. Air Force announced that it would develop its own variant from NASA's X-37A. 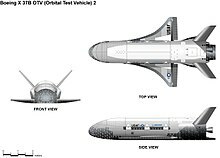 The Air Force version was designated the X-37B Orbital Test Vehicle (OTV). The OTV program was built on earlier industry and government efforts by DARPA, NASA, and the Air Force under the leadership of the U.S. Air Force Rapid Capabilities Office in partnership with NASA and the Air Force Research Laboratory. Boeing was the prime contractor for the OTV program. The X-37B was designed to remain in orbit for up to 270 days at a time. The Secretary of the Air Force stated that the OTV program would focus on "risk reduction, experimentation, and operational concept development for reusable space vehicle technologies, in support of long-term developmental space objectives". The X-37B was originally scheduled for launch in the payload bay of the Space Shuttle, but following the 2003 Columbia disaster, it was transferred to a Delta II 7920. The X-37B was subsequently transferred to a shrouded configuration on the Atlas V rocket, following concerns over the unshrouded spacecraft's aerodynamic properties during launch. Following their missions, X-37B spacecraft primarily land on a runway at Vandenberg Air Force Base, California, with Edwards Air Force Base as a secondary site. In 2010, manufacturing work began on the second X-37B, OTV-2, which conducted its maiden launch in March 2011. On 8 October 2014, NASA confirmed that X-37B vehicles would be housed at Kennedy Space Center in Orbiter Processing Facilities (OPF) 1 and 2, hangars previously occupied by the Space Shuttle. Boeing had said the space planes would use OPF-1 in January 2014, and the Air Force had previously said it was considering consolidating X-37B operations, housed at Vandenberg Air Force Base in California, nearer to their launch site at Cape Canaveral. NASA also stated that the program had completed tests to determine whether the X-37B, one-fourth the size of the Space Shuttle, could land on the former Shuttle runways. NASA furthermore stated that renovations of the two hangars would be completed by the end of 2014; the main doors of OPF-1 were marked with the message "Home of the X-37B" by this point. Most of the activities of the X-37B project are secret. The official U.S. Air Force statement is that the project is "an experimental test program to demonstrate technologies for a reliable, reusable, unmanned space test platform for the U.S. Air Force". The primary objectives of the X-37B are twofold: reusable spacecraft technology, and operating experiments which can be returned to Earth. The Air Force states that this includes testing avionics, flight systems, guidance and navigation, thermal protection, insulation, propulsion, and re-entry systems. In May 2010, Tom Burghardt wrote for Space Daily that the X-37B could be used as a spy satellite or to deliver weapons from space. The Pentagon subsequently denied claims that the X-37B's test missions supported the development of space-based weapons. In January 2012, allegations were made that the X-37B was being used to spy on China's Tiangong-1 space station module. Former U.S. Air Force orbital analyst Brian Weeden later refuted this claim, emphasizing that the different orbits of the two spacecraft precluded any practical surveillance fly-bys. In October 2014, The Guardian reported the claims of security experts that the X-37B was being used "to test reconnaissance and spy sensors, particularly how they hold up against radiation and other hazards of orbit". In November 2016, the International Business Times stated that the U.S. government was testing a version of the EmDrive electromagnetic microwave thruster on the fourth flight of the X-37B. In 2009, an EmDrive technology transfer contract with Boeing was undertaken via a State Department TAA and a UK export license, approved by the UK Ministry of Defence. Boeing has since stated that it is no longer pursuing this area of research. The U.S. Air Force has stated that the X-37B is testing a Hall-effect thruster system for Aerojet Rocketdyne. Processing for the X-37 is done inside Bays 1 and 2 of the Orbiter Processing Facility (OPF) at Kennedy Space Center in Florida, where the vehicle is loaded with its top-secret payload. The X-37 is then placed inside a fairing along with its stage adapter and loaded on a KAMAG transporter for delivery to the launch site, be it Cape Canaveral SLC-37, SLC-41, or Kennedy Space Center LC-39A. Landing is done at one of three sites across the country: the Shuttle Landing Facility at Kennedy Space Center, Vandenberg Air Force Base, or Edwards Air Force Base. To return to Kennedy Space Center, the X-37 is placed into a payload canister and loaded into a Boeing C-17 cargo plane. Once at Kennedy, the X-37 is unloaded and towed to the OPF, where it is prepared for its next flight, similar to the Space Shuttle. At the time of its maiden launch, the X-37 (far right) was the smallest and lightest orbital spaceplane yet flown. Both the North American X-15 and SpaceShipOne were suborbital. Of the spaceplanes shown, only the X-37 and Buran conducted unmanned spaceflights. The X-37 Orbital Test Vehicle is a reusable robotic spaceplane. It is an approximately 120%-scale derivative of the Boeing X-40, measuring over 29 feet (8.8 m) in length, and features two angled tail fins. The X-37 launches atop an Atlas V version 501 or a SpaceX Falcon 9 rocket. The spaceplane is designed to operate in a speed range of up to Mach 25 on its reentry. The technologies demonstrated in the X-37 include an improved thermal protection system, enhanced avionics, an autonomous guidance system and an advanced airframe. The spaceplane's thermal protection system is built upon previous generations of atmospheric reentry spacecraft, incorporating silica ceramic tiles. The X-37's avionics suite was used by Boeing to develop its CST-100 crewed spacecraft. The development of the X-37 was to "aid in the design and development of NASA's Orbital Space Plane, designed to provide a crew rescue and crew transport capability to and from the International Space Station", according to a NASA fact sheet. The X-37 for NASA was to be powered by one Aerojet AR2-3 engine using storable propellants, providing thrust of 6,600 pounds-force (29.4 kN). The human-rated AR2-3 engine had been used on the dual-power NF-104A astronaut training vehicle and was given a new flight certification for use on the X-37 with hydrogen peroxide/JP-8 propellants. This was reportedly changed to a hypergolic nitrogen-tetroxide/hydrazine propulsion system. The X-37 lands automatically upon returning from orbit and is the second reusable spacecraft to have such a capability, after the Soviet Buran shuttle. The X-37 is the smallest and lightest orbital spaceplane flown to date; it has a launch mass of around 11,000 pounds (5,000 kg) and is approximately one quarter of the size of the Space Shuttle orbiter. In 2013, Guinness World Records recognised the X-37 as the world's smallest orbital spaceplane. On 13 April 2015, the Space Foundation awarded the X-37 team with the 2015 Space Achievement Award "for significantly advancing the state of the art for reusable spacecraft and on-orbit operations, with the design, development, test and orbital operation of the X-37B space flight vehicle over three missions totaling 1,367 days in space". As of April 2019[update], the two operational X-37Bs have completed four orbital missions and one of them has been in orbit since 7 September 2017; they have spent a combined 2670 days in space. OTV-1 sits on the runway after landing at Vandenberg AFB at the close of its USA-212 mission on 3 December 2010. OTV-1, the first X-37B, launched on its first mission – USA-212 – on an Atlas V rocket from Cape Canaveral Air Force Station, Florida, on 22 April 2010 at 23:52 UTC. The spacecraft was placed into low Earth orbit for testing. While the U.S. Air Force revealed few orbital details of the mission, amateur astronomers claimed to have identified the spacecraft in orbit and shared their findings. A worldwide network of amateur astronomers reported that, on 22 May 2010, the spacecraft was in an inclination of 39.99 degrees, circling the Earth once every 90 minutes on an orbit 249 by 262 miles (401 by 422 km). OTV-1 reputedly passed over the same given spot on Earth every four days, and operated at an altitude of 255 miles (410 km), which is typical for military surveillance satellites. Such an orbit is also common among civilian LEO satellites, and the spaceplane's altitude was the same as that of the ISS and most other crewed spacecraft. The U.S. Air Force announced on 30 November 2010 that OTV-1 would return for a landing during the 3–6 December timeframe. 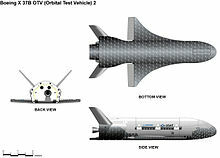 As scheduled, OTV-1 de-orbited, reentered Earth's atmosphere, and landed successfully at Vandenberg AFB on 3 December 2010, at 09:16 UTC, conducting America's first autonomous orbital landing onto a runway; the first spacecraft to perform such a feat was the Soviet Buran shuttle in 1988. In all, OTV-1 spent 224 days and 9 hours in space. OTV-1 suffered a tire blowout during landing and sustained minor damage to its underside. OTV-2, the second X-37B, launched on its inaugural mission, designated USA-226, aboard an Atlas V rocket from Cape Canaveral on 5 March 2011 at 22:46 UTC. The mission was classified and described by the U.S. military as an effort to test new space technologies. On 29 November 2011, the U.S. Air Force announced that it would extend the mission of USA-226 beyond the 270-day baseline design duration. In April 2012, General William L. Shelton of the Air Force Space Command declared the ongoing mission a "spectacular success". On 30 May 2012, the Air Force stated that OTV-2 would complete its mission and land at Vandenberg AFB in June 2012. The spacecraft landed autonomously on 16 June 2012, having spent 468 days and 14 hours in space. OTV-3, the second mission for the first X-37B and the third X-37B mission overall, was originally scheduled to launch on 25 October 2012, but was postponed because of an engine issue with the Atlas V launch vehicle. The X-37B was successfully launched from Cape Canaveral on 11 December 2012 at 18:03 UTC. The launch was designated USA-240. The OTV-3 mission ended with a landing at Vandenberg AFB on 17 October 2014 at 16:24 UTC, after a total time in orbit of 674 days and 22 hours. The Air Force launched a fourth X-37B mission, designated OTV-4 and codenamed AFSPC-5, aboard an Atlas V rocket from Cape Canaveral Air Force Station on 20 May 2015 at 15:05 UTC. The launch was designated USA-261 and is the second flight of the second X-37B vehicle. The mission was to test Aerojet Rocketdyne's XR-5A Hall-effect thruster in support of the Advanced Extremely High Frequency communications satellite program, and conduct a NASA investigation for testing various materials in space for at least 200 days. The vehicle spent a record-breaking 717 days and 20 hours in orbit before landing at Kennedy Space Center's Shuttle Landing Facility on 7 May 2017 shortly before 12:00 UTC. The fifth X-37B mission was launched on 7 September 2017 at 14:00 UTC atop a SpaceX Falcon 9 rocket from Kennedy Space Center Launch Complex 39A; the Falcon first stage returned to land at SpaceX's Landing Zone 1 at KSC and was returned to its processing facility before the arrival of Hurricane Irma. This launch was designated as USA-277. The spacecraft was inserted at a higher orbital inclination than previous missions to further expand the X-37B's orbital envelope. It later had its orbit modified. While the complete payload for OTV-5 is unknown, the Air Force announced that one experiment flying is the Advanced Structurally Embedded Thermal Spreader II (ASETS-II), which measures the performance of an oscillating heat pipe. A number of small satellites also shared the ride. The sixth X-37B mission, OTV-6, is planned to fly on an Atlas V 501 rocket in December 2019. The X-37A was the initial NASA version of the spacecraft; the X-37A Approach and Landing Test Vehicle (ALTV) was used in drop glide tests in 2005 and 2006. The X-37B is a modified version of the NASA X-37A, built for the U.S. Air Force. Two were built and have been used for multiple orbital missions. In 2011, Boeing announced plans for a scaled-up variant of the X-37B, referring to it as the X-37C. The X-37C spacecraft would be between 165% and 180% of the size of the X-37B, allowing it to transport up to six astronauts inside a pressurized compartment housed in the cargo bay. Its proposed launch vehicle is the Atlas V Evolved Expendable Launch Vehicle. In this role, Boeing's X-37C could potentially compete with the corporation's CST-100 Starliner commercial space capsule. Data from USAF, Boeing, Air & Space Magazine, and PhysOrg. ^ Source of flights: mission markings posted on side of White Knight aircraft. ^ This figure is based on pre-launch design estimates; it does not reflect the spacecraft's actual performance capacity. During its 2012–2014 test mission, the OTV-3 X-37B spent over 670 days in space. ^ a b "X-37B lands this morning at Vandenberg AFB". Santa Maria Times. 16 June 2012. Archived from the original on 26 June 2014. ^ a b Parsons, Dan (17 October 2014). "US Air Force's shadowy space plane lands after 674 days in orbit". Flight Global. Retrieved 18 October 2014. ^ a b Ray, Justin (7 May 2017). "X-37B spaceplane returns to Earth and makes autopilot landing in Florida". Spaceflight Now. Retrieved 7 May 2017. ^ a b c d e f g h "Fact Sheet: X-37 Orbital Test Vehicle". U.S. Air Force. 21 May 2010. Archived from the original on 26 June 2014. ^ a b "X-37 Technology Demonstrator: Blazing the trail for the next generation of space transportation systems" (PDF). NASA Facts. NASA. September 2003. FS-2003-09-121-MSFC. Retrieved 23 April 2010. ^ "Air Force Bloggers Roundtable: Air Force set to launch first X-37B Orbital Test Vehicle". United States Department of Defense. 20 April 2010. Retrieved 23 April 2010. ^ a b Clark, Stephen (2 April 2010). "Air Force spaceplane is an odd bird with a twisted past". Spaceflight Now. Retrieved 3 April 2010. ^ "NASA, Boeing Enter Cooperative Agreement to Develop and Fly X-37 Technology Demonstrator" (Press release). NASA. 14 July 1999. Press Release 99-139. Retrieved 20 October 2014. ^ a b Yenne 2005, p. 277. ^ Berger, Brian (15 September 2004). "NASA Transfers X-37 Project to DARPA". Space.com. ^ Berger, Brian (16 September 2004). "DARPA takes on space plane project". NBC News. Retrieved 19 October 2014. ^ David, Leonard (23 June 2005). "White Knight carries X-37 aloft". CNN. Retrieved 15 October 2012. ^ a b Parsch, Andreas (November 2009). "Boeing X-37 / X-40". Designation-Systems.net. Retrieved 2 August 2012. ^ a b "Mojave web log entries". MojaveWeblog.com. Archived from the original on 4 June 2006. Retrieved 15 October 2012. ^ David, Leonard (7 April 2006). "X-37 Flies At Mojave But Encounters Landing Problems". Space.com. ^ "X-37 Test Flight B-Roll (No Audio)". YouTube.com. U.S. Air Force. 22 April 2010. ^ a b David, Leonard (17 November 2006). "U.S. Air Force Pushes For Orbital Test Vehicle". Space.com. Retrieved 17 November 2006. ^ a b c d Clark, Stephen (22 April 2010). "Atlas rocket delivers Air Force spaceplane to orbit". Spaceflight Now. ^ Clark, Stephen (25 February 2010). "Air Force X-37B spaceplane arrives in Florida for launch". Spaceflight Now. Retrieved 3 March 2010. ^ a b c d e Krebs, Gunter. "X-37B OTV 1, 2, 3, 4". Gunter's Space Page. Retrieved 21 May 2015. ^ a b Covault, Craig (3 August 2008). "USAF To Launch First Spaceplane Demonstrator". Aviation Week. Archived from the original on 12 August 2011. ^ "Second secret space shuttle blasts into orbit ... but what does it actually do up there?". Daily Mail. 7 March 2011. Retrieved 15 January 2012. ^ a b Dean, James (8 October 2014). "NASA: Secret X-37B space plane will use shuttle hangars". Florida Today. Retrieved 9 October 2014. ^ Smith-Strickland, Kiona (27 May 2015). "Now We Know at Least Two Payloads on the X-37B". Air & Space/Smithsonian. Retrieved 27 May 2015. ^ Burghardt, Tom (11 May 2010). "The Militarization of Outer Space: The Pentagon's Space Warriors". Space Daily. Retrieved 15 October 2012. ^ Parnell, Brid-Aine (6 January 2012). "US 'space warplane' may be spying on Chinese spacelab". The Register. Retrieved 13 January 2012. ^ Corocoto, Genalyn (9 January 2012). "Expert: U. S. Secret Space Plane Not Likely 'Spying' on China Module". International Business Times. Archived from the original on 11 January 2012. Retrieved 13 January 2012. ^ Yuhas, Alan (27 October 2014). "X-37B secret space plane's mission remains mystery outside US military". The Guardian. Retrieved 28 October 2014. ^ Russon, Mary-Ann (7 November 2016). "Space race revealed: US and China test futuristic EmDrive on Tiangong-2 and mysterious X-37B plane". International Business Times. Retrieved 15 December 2016. ^ Shawyer, Roger (November–December 2015). "Second generation EmDrive propulsion applied to SSTO launcher and interstellar probe" (PDF). Acta Astronautica. 116: 166–174. doi:10.1016/j.actaastro.2015.07.002. ^ UK Department of Trade and Industry (2007). "Boeing End User Undertaking". Retrieved 15 December 2016. ^ Hambling, David (5 November 2012). "Propellentless Space Propulsion Research Continues". Aviation Week & Space Technology. Retrieved 16 December 2016. ^ a b Ray, Justin (27 April 2015). "X-37B launch date firms up as new details emerge about experiment". Spaceflight Now. Retrieved 27 April 2015. ^ Miller 2001, p. 377. ^ Grush, Loren (7 June 2017). "SpaceX scores contract to launch Air Force's secretive X-37B spaceplane". The Verge. Retrieved 3 September 2017. ^ David, Leonard (27 May 2005). "Mothership adopts a new space plane". NBC News. Retrieved 2 February 2013. ^ "X-37 Demonstrator to Test Future Launch Technologies in Orbit and Reentry Environments". NASA. May 2003. FS-2003-05-65-MSFC. Retrieved 2 February 2013. ^ a b Jameson, Austin D. (April 2001). "X-37 Space Vehicle: Starting a New Age in Space Control?" (PDF). Defense Technical Information Center. ADA407255. ^ "Mr. Gary Payton, Under Secretary of the Air Force for Space Programs, Media Teleconference (Pentagon), X-37B Launch" (PDF). Defense.gov. 20 April 2010. Archived from the original (PDF) on 25 January 2012. Retrieved 3 December 2010. ^ David, Leonard (5 April 2012). "Boeing's New Crew-Carrying Spaceship Taking Shape". Space.com. Retrieved 17 April 2012. ^ "Pilotless US space plane lands after 469 days in orbit". Space Daily. AFP. 17 June 2012. Retrieved 18 June 2012. ^ Anderson, William E.; Butler, Kathy; Crocket, Dave; Lewis, Tim; McNeal, Curtis (2000). Peroxide Propulsion at the Turn of the Century. 4th International Symposium on Liquid Space Propulsion. 13 March 2000. Heilbronn, Germany. 5487a. ^ Herbert, Bartt (24 July 2009). "Peroxide (H2O2) Test Programs, AR2-3 Flight Certification". NASA Engineering and Test Directorate. Archived from the original on 21 July 2011. ^ Smith-Strickland, Kiona (February 2016). "What's the X-37 Doing Up There?". Air & Space/Smithsonian. Retrieved 12 April 2016. ^ Chertok, Boris E. (2005). Siddiqi, Asif A., ed. Rockets and People Ракеты и люди (PDF). NASA History Series. 1. NASA. p. 179. SP-2005-4110. ^ a b Halvorson, Todd (9 December 2012). "AF's X-37B mini-shuttle shrouded in secrecy". Florida Today via Military Times. Archived from the original on 16 January 2013. Retrieved 10 December 2012. ^ Glenday, Craig, ed. (2012). Guinness World Records 2013. Guinness. p. 29. ISBN 9781904994879. ^ a b David, Leonard (8 May 2015). "Inside the US Air Force's Next X-37B Space Plane Mystery Mission". Space.com. Retrieved 11 May 2015. ^ a b c Krebs, Gunter. "X-37B OTV 1, 2, 3, 4, 5, 6". Gunter's Space Page. Retrieved 14 September 2017. ^ David, Leonard (22 May 2010). "Secret X-37B Space Plane Spotted by Amateur Skywatchers". Space.com. ^ "Amateur astronomers unravel X37-B orbit, say likely use for deploying spy satellites". News.com.au. 24 May 2010. ^ Broad, William J. (21 May 2010). "Surveillance is Suspected as Spacecraft's Main Role". The New York Times. Retrieved 22 May 2010. ^ "Preparations underway for first landing of X-37B". U.S. Air Force. 30th Space Wing Public Affairs. 30 November 2010. Archived from the original on 5 March 2012. Retrieved 21 May 2012. ^ "USAF X-37B Landing Slated for Dec. 3–6". Aviation Week. 30 November 2010. Retrieved 1 December 2010. ^ a b Clark, Stephen (3 December 2010). "Home again: U.S. military space plane returns to Earth". Spaceflight Now. Retrieved 3 December 2010. ^ Warwicj, Graham (3 December 2010). "USAF's X-37B Spaceplane Returns to Earth". Aviation Week. Archived from the original on 6 June 2012. Retrieved 2 June 2012. ^ Rincon, Paul (3 December 2010). "X-37B US military spaceplane returns to Earth". BBC News. Retrieved 3 December 2010. ^ McCants, Mike. "OTV 2 (USA 226) Satellite details 2011-010A NORAD 37375". N2YO.com. Retrieved 8 April 2012. ^ a b Clark, Stephen (5 March 2011). "Air Force's second robotic space shuttle circling Earth". Spaceflight Now. ^ Wall, Mike (5 March 2011). "Secretive X-37B Space Plane Launches on New Mystery Mission". Space.com. Retrieved 8 April 2012. ^ Clark, Stephen (29 November 2011). "Military space shuttle receives mission extension". Spaceflight Now. Retrieved 1 December 2011. ^ David, Leonard (9 May 2012). "Air Force's secret X-37B a 'spectacular success'". NBC News. Retrieved 10 May 2012. ^ "Preparations underway for X-37B landing". U.S. Air Force. 30th Space Wing Public Affairs. 30 May 2012. Archived from the original on 2 June 2012. Retrieved 1 June 2012. ^ David, Leonard (30 May 2012). "Air Force's Secretive X-37B Space Plane Will Land Soon". Space.com. Retrieved 2 June 2012. ^ Wall, Mike (16 June 2012). "Air Force's secret X-37B space plane lands in Calif. after mystery mission". Space.com. ^ Ray, Justin (18 September 2012). "Another Atlas 5 readied to launch mini space shuttle". Spaceflight Now. Retrieved 4 October 2012. ^ McCullough, Amy (25 October 2012). "X-37B Launch Delayed". Air Force Magazine. Archived from the original on 20 February 2014. Retrieved 11 December 2012. ^ a b c Atkinson, Nancy (11 December 2012). "Air Force's Secret X-37B Space Plane Launches on Third Mission". Universe Today. Retrieved 11 December 2012. ^ David, Leonard (21 November 2012). "New Delay for Mysterious Military Space Plane Launch". Space.com. Retrieved 26 November 2012. ^ "NSSDC ID: 2012-071A". National Space Science Data Center. NASA. Retrieved 24 December 2012. ^ Badger, Eric (11 December 2012). "Air Force launches 3rd X-37B Orbital Test Vehicle". U.S. Air Force. Archived from the original on 26 June 2014. ^ "Secret space plane lands at US air force base after unknown two-year mission". The Guardian. Associated Press. 17 October 2014. Retrieved 17 October 2014. ^ Wall, Mike (17 October 2014). "X-37B Military Space Plane Lands After Record-Shattering Secret Mission". Space.com. Retrieved 17 October 2014. ^ Ray, Justin (20 May 2015). "Recap story: X-37B spaceplane embarks on fourth voyage in orbit". Spaceflight Now. Retrieved 11 October 2016. ^ "Aerojet Rocketdyne's Modified XR-5 Hall Thruster Demonstrates Successful On-Orbit Operation" (Press release). Aerojet Rocketdyne. 1 July 2015. Retrieved 11 October 2016. ^ Wall, Mike (20 May 2015). "US Air Force Launches X-37B Space Plane on 4th Mystery Mission". Space.com. Retrieved 21 May 2015. ^ Jackson, Amanda (8 May 2017). "Air Force's mysterious space plane lands, wakes up Florida". CNN. Retrieved 12 July 2017. ^ a b Grush, Loren (7 September 2017). "SpaceX launches Air Force's spaceplane just before Hurricane Irma reaches Florida". The Verge. Retrieved 7 September 2017. ^ Graham, William (7 September 2017). "SpaceX launches first X-37B launch with a Falcon 9". NASASpaceFlight.com. Retrieved 7 September 2017. ^ Bergin, Chris (9 September 2017). "SpaceX Falcon 9: X-37B OTV-5: September 7, 2017: Updates". NASASpaceFlight.com. Retrieved 9 September 2017. ^ a b "Air Force preparing to launch fifth Orbital Test Vehicle mission". Air Force Space Command. Air Force News Service. 31 August 2017. Retrieved 1 September 2017. ^ David, Leonard (15 August 2018). "Mysterious X-37B Military Space Plane Nears 1 Year in Orbit". Space.com. Retrieved 17 August 2018. ^ "Advanced Structurally Embedded Thermal Spreader II (ASETS-II)" (PDF). Air Force Research Laboratory. 10 August 2017. Retrieved 27 August 2017. ^ a b Klesius, Michael (January 2010). "Space Shuttle Jr". Air & Space Magazine. ^ David, Leonard (7 October 2011). "Secretive X-37B US Space Plane Could Evolve to Carry Astronauts". Space.com. Retrieved 10 October 2011. ^ "Boeing vs. Boeing". Citizens in Space. 25 March 2012. Retrieved 21 December 2012. ^ a b "X-37B Orbital Test Vehicle". Boeing.com. Archived from the original on 21 March 2015. Retrieved 6 December 2010. ^ Antczak, John (3 April 2010). "Air Force to launch robotic winged space plane". PhysOrg. Associated Press. Retrieved 16 February 2013. ^ Molczan, Ted (22 May 2012). "Re: X-37B OTV 2-1 search elements". Satobs.org. Retrieved 2 June 2012. ^ Evans, Michael (24 April 2010). "Launch of secret US space ship masks even more secret launch of new weapon". The Times. Archived from the original on 29 May 2010. Retrieved 25 April 2010. Bentley, Matthew A. (2008). Spaceplanes: From Airport to Spaceport. New York: Springer. Bibcode:2009sfas.book.....B. ISBN 978-0-387-76509-9. Gump, David P. (1989). Space Enterprise: Beyond NASA. Westport, CT: Praeger. ISBN 978-0-275-93314-2. Miller, Jay (2001). The X-Planes: X-1 to X-45. Hinckley, UK: Midland. ISBN 978-1-85780-109-5. Yenne, Bill (2005). The Story of the Boeing Company. Minneapolis, MN: Zenith. ISBN 978-0-7603-2333-5. Wikimedia Commons has media related to Boeing X-37. This page was last edited on 11 March 2019, at 01:20 (UTC).